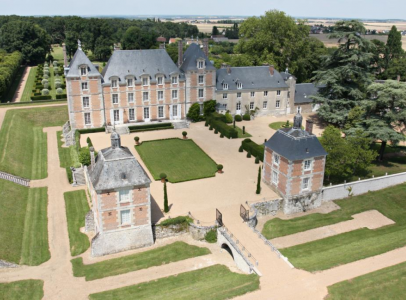 Exceptional listed chateau for sale, 114 mi South West from Paris. The chateau was built in the early 17th century and comprises a main building surrounded by to two slightly high and overhanging pavilions. It is a very beautiful construction in brick and stone topped by high slate roofs. An extension was built in the 18th century, a stone building called “the small chateau”, topped by a Philibert Delorme style roof. On the high ground floor, the reception rooms are bright, well laid out and offer great volumes. 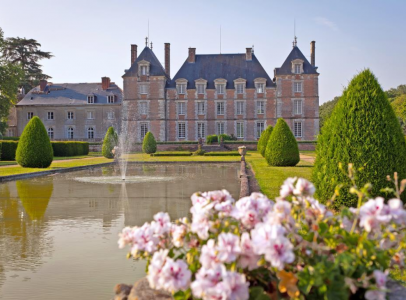 They overlook the dry moats and look over the magnificent landscaped garden, designed by Le Nôtre, and over a ravishing courtyard surrounded by 2 other constructions. Entrance (31sqm) with tiled floor (Bourgogne stone) and a stone staircase with iron wrought balusters. On the west side, a small sitting room (31sqm) and a study with Versailles parquet flooring (34 sqm). 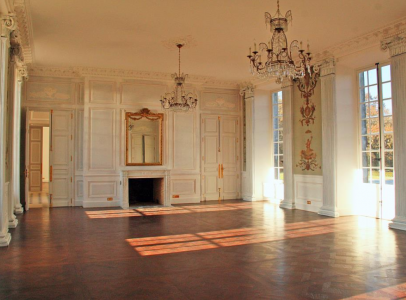 On the east side: large sitting room (92 sqm) with Versailles parquet flooring, decorated with Louis XVI painted canvas and paneling topped with ionic capitals. This room has got two marble fireplaces with pier-glasses, situated opposite each other. The ceiling is decorated with moulded cornices. Small sitting room, dining room (45sqm). Hallway with lift serving all the floors. Beautiful fully equipped kitchen (Wilkinson, 43sqm). Bathrooms. Back stairway. On the extension, a beautiful 80sqm flat for the staff member: study, small sitting room (30sqm), bedroom (23sqm), bathroom with toilet and dressing room. 10 independant bedrooms or en-suite bedrooms, each one with a bathroom or shower room and its separate toilet. Technical rooms and laundry room. On the second and third floor : 4 bedrooms each one with an antechamber or an study/library, 5 bathrooms and shower rooms with toilet. On the basement: This floor comprises the former vaulted kitchen, with tiled floors and equipped with its old oven. Some vaulted rooms: cellars, stockrooms, a room with a well, former coal bunker. Hallway, hand wash basin, technical rooms: cold water suppressor, mechanical ventilation, patch bay, boiler room, etc. Some rooms have openings to the dry moats. 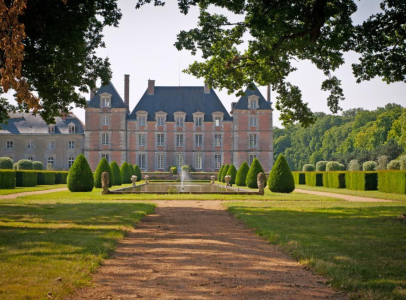 Two elegant buildings situated in front of the chateau, remind the two pavilions set on each side of the chateau. One is the former caretaker’ s lodge, the other one, the chapel. On the extension of the chateau, one can find two large garages (90sqm) and a woodshed built on wooden posts. the stables with 4 large horse loose boxes, a tack room and the blacksmith’ s room, a caretaker’ s lodge, about 5 rooms with gas heating system, a flat of about 3 rooms, ready to live in, 2 other flats, restoration needed, laundry room, former latrines and sheds. On the back, around a large farmyard: a 3 room dwelling, a kennel, a barn, a shed for material and garages, workshop, former press, 3 draft horse loose boxes. 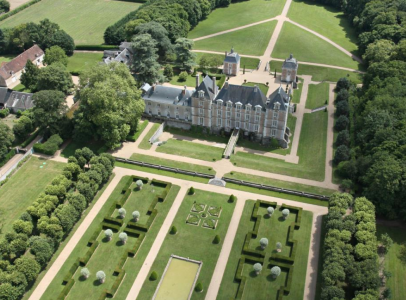 In front of the chateau, beyond the courtyard, lies a lawn flanked by two double lines of chestnuts trees. 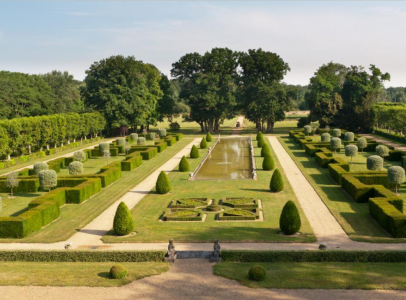 At the back of the chateau one discovers the beautiful landscaped gardens carried out in 1755 by Morel, a landscape architect, on the plans of Le Nôtre. The gardens offers beautiful compositions of boxwoods and yew trees and a magnificent stone pond (80m long), equipped with water jets, that constitutes a beautiful water mirror. Further away, a landscaped vegetable garden and orchard. Entirely walled. Beautiful parkland with large alleys and wonderful views. Clusters oak trees, majestic cedars. The whole property is closed by walls or fences. All in about 98 acres. 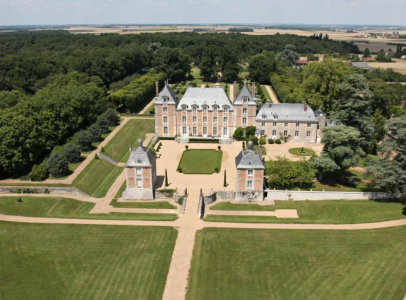 Flagship of the early 17th century French architecture, this listed château will enchant you by the purity of its lines, the beauty of its garden and its successful restoration.